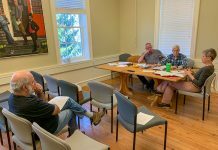 The Oak Bluffs planning board and selectmen held a joint meeting on Tuesday to decide which of three candidates should finish the term of Kris Chvatal, who resigned from the planning board May 10. Jeremiah McCarthy, Jordan Wallace, and Bill Vrooman all made their case to the members of the combined boards. Mr. McCarthy won handily. He will complete Mr. Chvatal’s term, and the seat will be up for election next April. Mr. McCarthy is a fourth-generation Islander, and owner of the Dockside building on Oak Bluffs Harbor and OB Pirate Adventures. He is also an attorney. His father, Terry McCarthy, was a former state rep.
“I think training as an attorney teaches you to look at all sides,” he said. “Long-term planning decisions affect us all on a deep level. It’s important we preserve the character of this town. 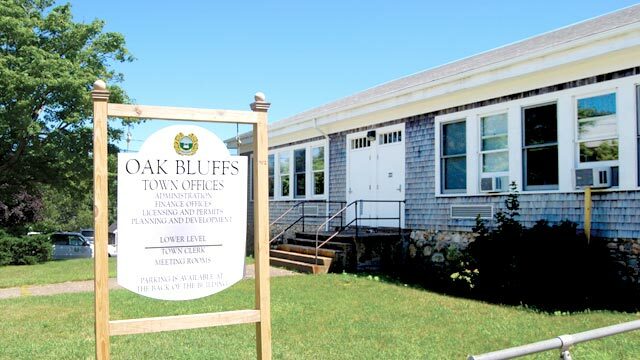 It’s one of the reasons we live here.” Mr. McCarthy added that he would like to focus his energies on a new Oak Bluffs master plan. In other business, the board of selectmen approved changes to loading-zone hours, which will now begin two hours earlier, at 7 am, and end at 5 pm. The loading zone at the foot of Kennebec Avenue will allow 15-minute parking after 5 pm. Hours for the loading zone at Nancy’s will begin two hours earlier, at 6 am, and end at 5 pm. Selectmen approved a measure that allows bars and restaurants to serve alcohol until 1:30 am over the holiday weekend, from July 1 to July 4. Selectmen also approved the procurement of four electric cars for town use. 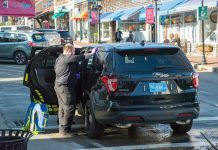 In a memo to chairman Gail Barmakian, town administrator Robert Whritenour said that with incentives from the Massachusetts Electric Vehicle Incentive Program (MassEVIP), the cost of each car will be $323 per year over a three-year lease. The cars will be used by personnel from the assessor’s department, building department, health department, and the library.